With so many dance releases coming from the hands of European artists, seeing the rising success of an American producer brings some balance to the table. Not only from the states but also the city of San Francisco, Ken Loi has attracted a steady following of electro progressive house lovers. On top of his prodigious mashups and remixes, his most recent originals have been "The Wall" and "Knock Down", put out on Starbright and Laidback Luke's venerable Mixmash Records. 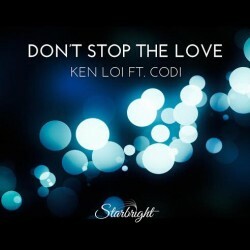 Today EARMILK has been lucky enough to snag the premiere of "Don't Stop The Love", a driving, melodic progressive house track that exudes feel-good vibes. From bold chord progressions to Codi's sweetly resonating vocals, the song sounds like the perfect fit to an epic festival set. Keep an eye out for the release on Monday and more to come from the talented Ken Loi.